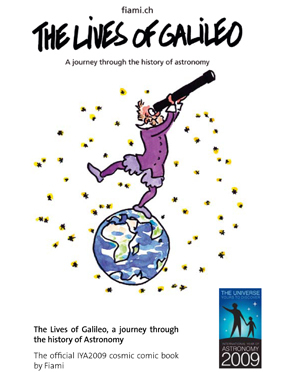 For the first time, astronomy and Galileo are presented in an historical, accessible and humoristic comic book. In 40 colour-filled pages organised into six stunning chapters, Galileo plays different roles through the ages of great astronomical discoveries: In Babylon, he learns how to write in clay and how to read the sky. In Alexandria, he measures the circumference of the Earth alongside Eratosthenes using the shade of a stick. On the Ganges, Aryabhata explains to him that the Earth rotates around a central axis. In Venice, he relives the revolutionary moment when he first peered out into the vastness of the Universe through a telescope. In Greenwich he mixes with Newton and Halley (and "his" comet). Galileo is back to show us the purpose of modern astronomy - why don't you join the adventure and explore with him? The comic "The lives of Galileo" shows that history of science is first a wonderful history of share of knowledge across the earth and across centuries. Sky and astronomy has no owners, we belong to the sky and not the opposite, "The lives of Galileo" shows it in humoristic and teaching way. "The Lives of Galileo" is translated in 7 languages: French, English, Galician, Dutch, Finnish, Thaï and Italian and is diffused all over the world.